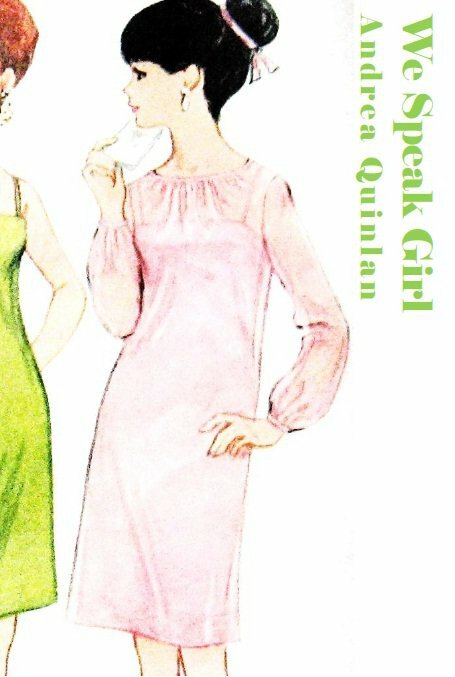 We Speak Girl is the chapbook debut of Christchurch-based Andrea Quinlan, an enigmatic collection of poetry inspired by fashion, film, fairy tale and feminism. It will come as small surprise then that Quinlan is also the founder and editor of the feminist zine Through the Looking Glass. And clarity gleaned through distortion is a good way to summarise Quinlan’s stylistic approach. In part one of "3 Poems from Sedmikrásky’," "Frills," Quinlan juxtaposes scene descriptions from the 1966 Czech film otherwise known as Daisies with detailed inventories of women’s clothing. "A fashion show" it begins, and the effect of the alternating one then two line stanzas is to make the reader feel as if they have front row seats beside a catwalk, until the penultimate stanza where further quotes from the film are utilised to critique the preceding action before the poem collapses into the rails in its final stanza. Part two, "The Butterfly Collector," raises prescient questions about "the coveted," particularly what right that which is coveted has to be other than object versus the justification of the collector to inflict suffering on that which he desires. The third and final part of the Sedmikrásky sequence offers further comparison between object, woman and food. Think Edible Woman visits natural history museum in Liberty evening wear whilst being filmed by the paparazzi and you get something of a feel for the response this poem elicits. A favourite poem for this reviewer is "May Queens," where Quinlan carefully erects a scaffold of tropes then subverts them, exhibiting her peculiar talent at its best and demonstrating the arbitrary criterion employed by hierarchies to boot. "Story Bough Dress" is the collection’s penultimate poem and perhaps the strongest. The simple structure and narrative form belies the complex psychology of the piece. Ostensibly a diary of costumes and various functions the speaker intends them for, headed by a list of the days of the week, each excerpt explores something of the narratives used to define women in literature and associated media. The speaker describes wearing the costumes in the same way she inhabits the scenes and therefore the roles they depict for her. Until the final stanza that is. "I don’t feel that waiting around in an attic is part of my story." A diamond-cut satire; with an invisible point Quinlan dissects what it is to be female in contemporary society. Surprisingly, or not, is how timeless this brand of girl is. Quinlan’s debut offers a disturbingly clear picture of girl culture, one that’s difficult to dismiss, if one is prepared to step inside and take a look. Rachel J. Fenton was born in Yorkshire and now lives in Auckland. Most recently shortlisted for the Royal Society of New Zealand Manhire Prize, she won AUT's Creative Writing Prize for her graphic poem "Alchemy Hour." Links to more work can be found at her blog.